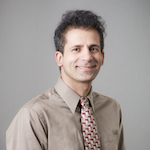 Dr. Nazarian's teaching and research activities span over a broad range of topics related to design, optimization and verification of digital hardware and software systems. He has designed several USC undergraduate and graduated courses on logic design, SoC design, system verification, sofware and algorithm design for electrical engineers. He has worked as a consultant and designer for numerous projects involving semiconductor and software companies such as Broadcom, Facebook, Fitbit, Fujitsu, Google, Huawei, Hulu, Intel, LG, MediaTek, MStar, Nokia, Qualcomm, Samsung, Semcon, Synopsys, TI, TiVo, and ZTE.